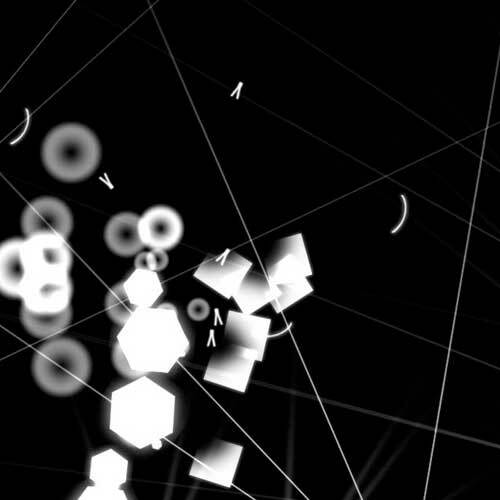 Cimes is an instrument dedicated to the interpretation and visual performance of electroacoustic music pieces. Cimes is special for its odd status, hybridizing the expressionism of an instrument with the determinism of a musical score. The project revolves around the concept of the «sound capsule» : that is the combination of a sound and an animated shape placed on a map, that can be played through refined, intuitive interaction by a performer during a concert. This map may be called a «browsable musical score», a concept and expression invented by electroacoustic music composer Roland Cahen. Please be patient, the player is loading... But if it really doesn't, get the Flash Player there. With a focus on its usability during concerts, Cimes interface is intended for the sole use of the performer. 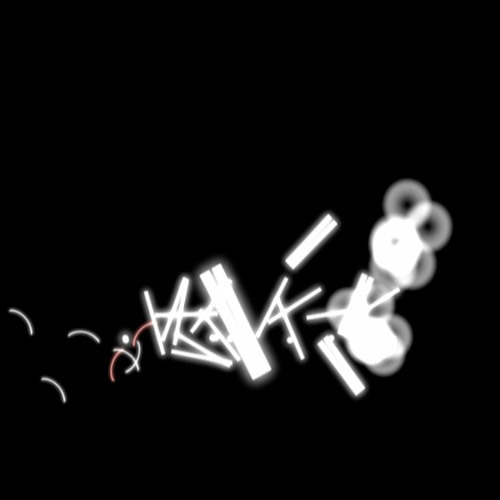 The performer interacts with the piece through a joystick (and more recently a Wiimote ! 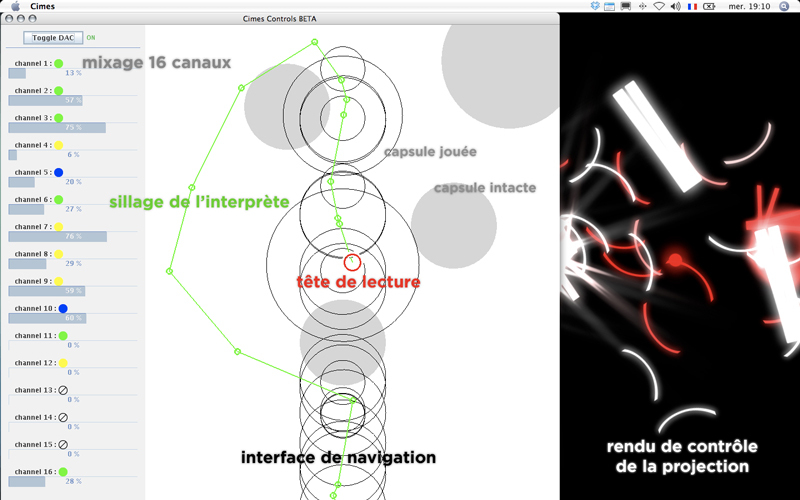 ), by browsing through a map of «sound capsules» that he or she launches by reaching them with a cursor. Simultaneously, a video projection dedicated to the public represents the sound events happening due to the performer's actions, displaying a range of shapes and animations that are specifically designed for each piece. In order to be presented for 15 days in an exhibition space during the International Design Biennial in St-Étienne, a small concert was filmed and reproduced as a video installation in a space designed accordingly to a typical Cimes performance scenography : a projection screen was used as ceiling, under which an oblique net was disposed for the public, placed in a dark and comfy ambiance for the most agreable and immersive experience possible. Cimes' first piece (sound by Éric Broitmann, motion & visuals by Matthieu Savary) will be premiered as a performance in the context of the Sublime Sonus Part 2 event organised by Roland Cahen (free entrance, full info on the Cube site). immersive installation built into the exhibition space that is dedicated to Research and Experiments in graphic and sound design lead by students or former students of art & design schools in Europe (exhibition space N-1, building 335), during the International Design Biennial in St-Étienne (see on Vimeo). smallab.org | on Flickr | on Vimeo | 2008-2019 © SMALLAB.ORG • Matthieu Savary & Collaborators. All rights reserved.